Frances McLeod was born in Toronto in 1914. After graduation, she studied near Paris at an international school called le Collège féminine de Beaumont. Upon her return to Canada, at her mother’s suggestion, the eighteen-year old Blue took landscape architecture lessons from Lorrie Grubb, who had come to Canada in 1911 from England and became the first Canadian female landscape architect. 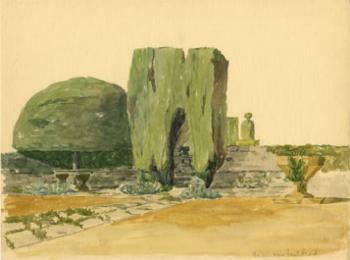 Blue, deeply influenced by Grubb, enrolled at the Lawthorpe School of Landscape Architecture in Groton, Massachusetts. She graduated in 1937, then worked in the United States for a short time. Her first project was in an office in Groton. She later moved to New York to work on private garden designs. One of Canada's earliest female architects, Frances McLeod became an associate member of the Canadian Society of Landscape Architects and Town Planners in 1938. The nine-member society had been founded in 1934 with three of the members being female. During the depression years, Frances returned to Canada but, in 1940, she moved to Atlanta, Georgia, to work in private gardens for a year. When she made her final move back to Canada, she volunteered with the Canadian Red Cross Society. Frances met Richard Blue when he returned from England where he had served as a rifleman in the Canadian army. The two married and had a daughter, Susan. In 1946, they bought a farm in Aurora where their son, Tony, was born. They farmed for 17 years until Richard became ill and eventually died. Through the years, Blue had transformed their plain home into a beautiful property with lawns and gardens. Following the war, Blue did not have time to resume her landscape architecture practice beyond her home and a few local projects. However, during the years 1941 to 1970, Blue served in many different positions with the Canadian Society for Landscape Architects (CSLA) and played an important role in its internal organization. In 1970, she wrote a short but significant manuscript describing its history. She produced a number of other publications as well relating to the development of the profession. In 1983, she received the Ontario Associations of Landscape Architects’ Distinguished Achievement Award for her contributions to the profession. The Frances McLeod Blue Collections were established in 2007 for two purposes. First, they contains her personal records in a separate fonds, i.e. her photographs, glass slides, drawings, watercolours, school projects and gardening books. Second, they contain historical records in smaller collections pertaining to the development of landscape architecture in Canada in the pre-1975 period help to expand our historical understanding. The Library and the Landscape Architecture Canada Foundation are partnering in the development of this important archive. Future accessions are anticipated. The Frances McLeod Blue fonds consists of photographs and negatives and her own pen and ink drawings, pencil drawings, and watercolours of gardens and flowers. The fonds has her 56 glass negatives of Italian gardens from the 1930s, a three-week examination problem dated 30 May 30 1936, and a thesis for certificate pen and ink drawing (June 1937). Three books from her personal collection include: "The Garden Month by Month" (1907) by Mabel Cabot Sedgewick; "English Gardens" (1925) by H. Avray Tipping; and "Garden Ornament" (1927) by Gertrude Jekyll and Christopher Hussey. McLeod Blue’s 13-page paper on the history of the Canadian Society of Landscape Architects, written in 1970, remains familiar to landscape architect students to this day. Landscape architecture drawings by Louise W. Heringa, ca. 1930-39. Drawings by L.W. Heringa including the forecourt of St. John's Hospital (Willowdale,) the layout of J.C. Clarke home ground in Goderich, Oakville High School Gardens, and historical layouts probably used as teaching aids, ca.1930-1939. Papers relating to landscape architect Edward I. Wood, 1942-84. A collection of items relating to architect Edward Wood, including his correspondence with Prime Minister Mackenzie King, 1942-1984.: call no. XL1 MS A006. Wood graduated from the Ontario Agricultural College in 1929 and the Harvard School of Design in 1933. In 1934 he joined the National Capital Commission, Ottawa, as Director of Project Design. He was an active member of the CSLA and its President from 1948-50 and 1958-60. Sasaki, Strong and Associates Ltd.: a collection of architecture prints by the firm of Sasaki, Strong and Associates, Toronto, 1962-1967, established for work by Hideo Sasaki and Richard Strong. Features Moss Park (Toronto); Toronto City Hall Square; British American Oil Ltd (Clarkson, Ont. ); as well as a bank and canal, Expo 67, Montreal. Sheridan Nurseries Limited (Etobicoke, Ont.). Seed catalogues, trade lists, and print publications covering selected years, 1928-1987. This collection is available for viewing in Archival & Special Collections during our regular business hours.